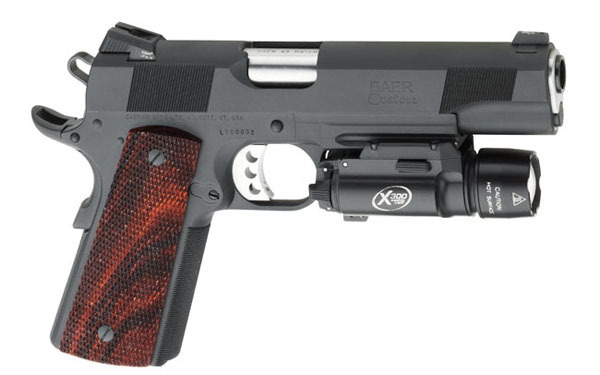 Designed for things that go bump in the night, the Les Baer Recon is a full size 1911 with an integral picatinny rail system for easy mounting of your weapon mounted light. Features a national match slide barrel with stainless bushing, three dot night sights, forward cocking serrations, Baer speed trigger with crisp 4 lb. pull, Baer deluxe hammer and sear, Baer tactical style extended combat safety, beveled mag well, polished feed ramp and throated barrel, tuned extractor, Baer extended ejector, Baer checkered slide stop, lowered and flared ejection port, high checkered 30lpi front strap, flat serrated mainspring housing, tuned for total reliability, rounded edges, Baer Premium Checkered Cocobolo grips, bead blast blue finish, (2) 8-round magazines, and a Streamlight TLR-1 weapon mounted light.